The old saying about not being able to fight city hall was on full display recently at the Elk Grove City Council meeting. 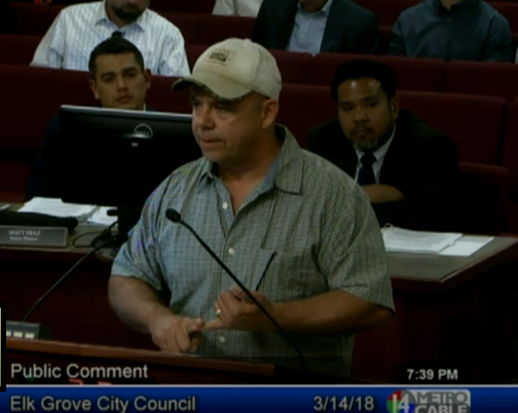 During the Wednesday, March 14 meeting an Elk Grove resident expressed frustration in his dealings with the city's bureaucrats. In remarks made during the public comment section of the meeting, Frank Freeno voiced numerous concerns regarding flooding on his Sheldon area residence and his dealings with city hall seeking a resolution. While an exchange of emails showed some employees at city hall have been working on the problem, Freeno's comments were more revealing about how individual city council members and the mayor respond to email requests from constituents. Specifically, Freeno asserted that he had emailed each city council members and the mayor on several occasions and none of the five had bothered to respond. "I've called [council member] Pat Hume - no response," Freeno said. "I've sent emails to each one of you guys - no response. I'm frustrated, that's why I'm here." Even though Hume, Mayor Steve Ly, and Council Member Steve Detrick tried to defend against the claim lack of a response, Freeno's comments dispelled one of the leading pillars of the council's defense of the from-district representation. All five current council members, have at various times in the respective tenures, have said the from-district form of representation makes them responsive to all constituents, whether or not they live in the district the council members represent. In the current from-district, the four council members live in defined districts but are elected by the entire city. The council members argue that being chosen by the entire body of city voters, not just voters in one specific area, they will be compelled to be responsive to any outreach from a constituent. Based on this case, that theory was put to the test and all four council members and the mayor failed in their self-proclaimed duty to be responsive to a constituent regardless of where they reside, which is this case was Hume's district. This is not the first time in recent months where constituents complained during public comment about the lack of responsiveness of the council members. In July 2017 another resident expressed scorn toward the lack of responsiveness to his complaints and Pat Hume was again targeted for specific criticism. (see video here). Interestingly, in his response, Ly Jeff Sessioned the city council's administrative assistant. See Freeno's comments and council members responses in the video below. No surprise here that the Elk Grove City Council members refused to take responsibility for their own actions and blamed it on the "girl in the office." We should take a vote on which council member had the best excuse for not responding to Mr. Freeno. Watching the meeting on Wednesday evening, I was shocked to see Mr. Ly blame the city council's administrative assistant, by name no less. Regardless of fault, Mr. Ly failed in the most basic of leadership skills when in the face of adversity he shifted the blame to someone other than himself. Mr. Ly failed the Harry S. Truman test - he unflinchingly passed the buck. Perhaps we have a new verb for our use when the mayor or city council blames someone else for their failing - they Jeff Sessioned someone. Interesting it appears to be District 2 residents who have come forward with their concerns after contacting their representative many times over. Of late, we have these two gentlemen along with Jim Kelly who was so upset he started a by-district initiative. There seems to be a Pat...tern here! The entire city council needs to remember they work for us, not the other way around. To hear a councilman pass the buck to a failure with his secretary notifying him was just pathetic. Do your jobs, and take care of this mans issue.